Just prep, chill, and serve. 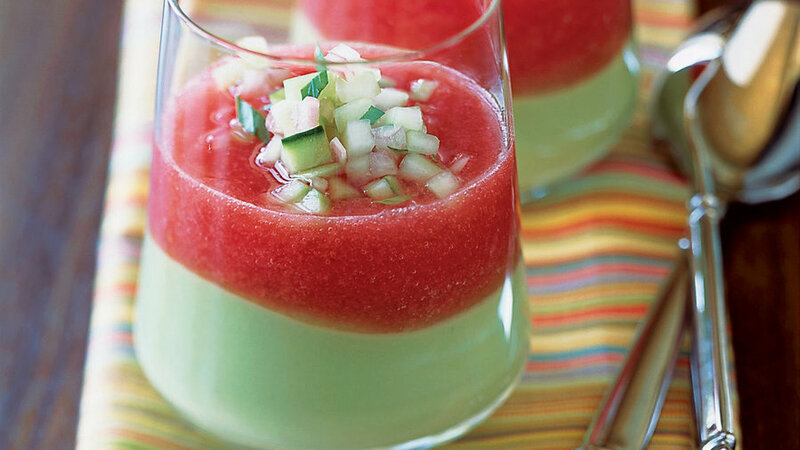 Try creamy Chilled Cucumber, luscious Tiered Tomato, and more. The last thing you want to do on a muggy August night is turn on the stove. That’s why cold soups make great summer meals ― they’re light, refreshing, and essentially ready to serve straight from the fridge. Most of these recipes require at least two hours of chilling time; make them a day ahead so they’re cool and ready when you are. Our readers give this summer pleaser 5 stars for its quick, easy preparation and colorful presentation. Clear, straight-sided glasses or wineglasses show off the layers of color best, but large martini glasses also work. You can also use soup bowls and keep the layers a surprise. This summer soup is pure essence of corn. Blanching the basil, an herb that tends to blacken once it’s cut, keeps it jewel green. This easy, creamy soup is as cool as the cucumbers in it. Garnish it with a sprinkle of cayenne or chopped fresh dill. To cut down on time and effort, use store-bought tortilla chips instead of making your own.